Come hang out and share suggestions for serving you better, make something cool and chat with your Teen Librarian about books, movies and more! This month’s craft is Friendship Bracelets. Are you age 50 or older? Do you need to refresh your driving skills and learn new rules of the road? Take the new AARP Smart Driver Course and learn research-based driving strategies to help you stay safe behind the wheel. You could also reduce your insurance costs – check with your insurance provider about a Smart Driver discount. This is a two-part series. Participants must attend both sessions to receive the DMV certificate. (Second session will be Saturday, January 26.) 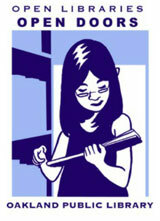 Please register at the Montclair Library or call (510) 482-7810 to RSVP. Come hang out and share suggestions for serving you better, make something cool and chat with your Teen Librarian about books, movies and more! This month’s craft is Candy Surprise. Rainy days are perfect for visiting museums – either IRL through the library’s Discover & Go program, or virtually through the magic of books. Meet Me at the Museum by Anne Youngson (FIC YOUNGSON) – This epistolary novel is told through the at-first-accidental correspondence between Danish professor and recent widower Anders and isolated, disenchanted English farmwife Tina. Brought together by a shared fascination with the Tollund Man, which is on display at Anders’s museum, they begin writing letters to one another and discover they have more in common than they could have imagined. Annie Barrows (The Guernsey Literary and Potato Peel Pie Society) blurbed the book – if you liked the tone and pacing of her book, you’ll probably like this one, too. Museum of Modern Love by Heather Rose (FIC ROSE) (not at Montclair) – Based on a real piece of performance art where visitors to the Museum of Modern Art sat across a table from artist Marina Abramović, this book chronicles the exhibit’s effect on a fictional man going through creative and romantic struggles. Impossible Views of the World by Lucy Ives (FIC IVES) – Stella, a cartographic specialist at Manhattan’s renowned (and fictional) Central Museum of Art, finds a photocopy of a meticulously detailed and illustrated old map of a 19th-century utopian settlement folded up in her dead colleague’s pencil drawer, leading her down a rabbit hole that’s part midlife crisis, part send-up of the museum world and part “art historical mystery that will interest fans of Donna Tartt’s The Goldfinch” (Kirkus Reviews), although the mystery part didn’t quite deliver on its promising premise, IMHO. The Bowl is Already Broken by Mary Kay Zuravleff (FIC ZURAVLEFF) (not at Montclair) – The new acting director of the National Museum of Asian Art faces must deal with her pregnancy, the disappearance of her mentor, an embezzling colleague and the dropping of a bowl once owned by Thomas Jefferson. Museums, with their dark corridors, aura of history and dusty basements full of secrets, seem to lend themselves to stories of murder and intrigue, so you’ll find lots of murder mysteries set at museums, including Murder at the National Gallery by Margaret Truman (MYS TRUMAN) (not at Montclair) – During the mounting of a prestigious exhibition at the National Gallery featuring a newly discovered painting by Caravaggio, art gallery owner Annabel Smith and her law-professor husband Mac are drawn into a high-stakes international art world in which obsession can lead to murder. The Looters by Harold Robbins and Junius Podrug (FIC ROBBINS) (not at Montclair) – Museum curator Madison Dupre pays $55 million dollars on behalf of her employer to buy the golden death mask of Semiramis, an ancient Babylonian queen. But accusations soon arise that the mask was stolen during the looting of the Iraqi museum when American troops entered Baghdad – and international intrigue and murder ensue. Still Lives: A Novel by Maria Hummel (FIC HUMMEL) (not at Montclair) – An avant-garde artist and feminist icon stages an exhibition comprised of self-portraits depicting herself as famous, murdered women — the Black Dahlia, Chandra Levy, Nicole Brown Simpson — which supporters hope will save the historic Rocque Museum from financial trouble. But fear mounts when the artist never shows up to her opening night gala. Want even more museum books? 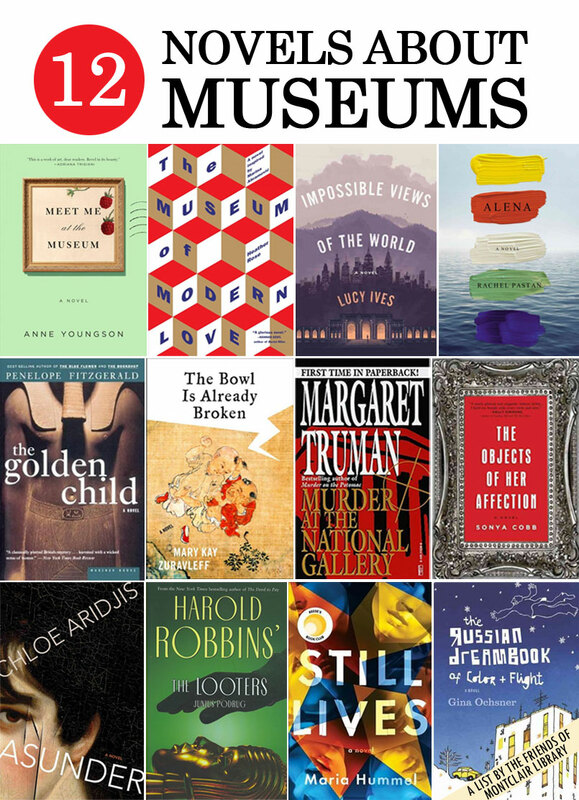 Check out our previous post about crime novels set in the art world and this list of nonfiction books about behind-the-scenes lives of museums and patrons.